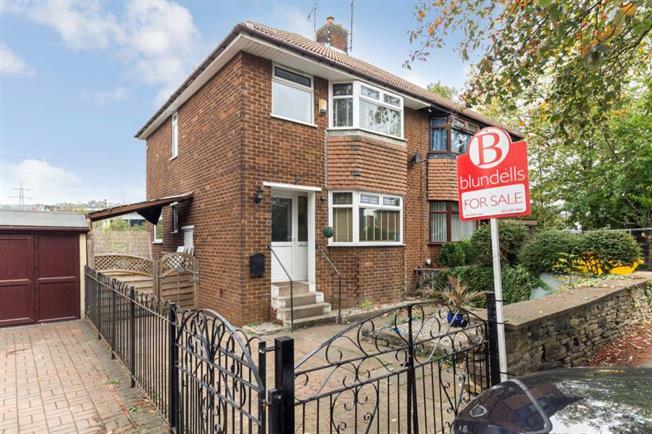 3 Bedroom Semi Detached House For Sale in Sheffield for £150,000. An excellent opportunity to acquire with no chain this beautifully presented three bedroomed semi detached family home. Located on a cul-de-sac on the edge of Hillsborough bordering Wadsley Bridge. Offering accommodation over two levels with the benefit of double glazing, GCH, off road parking, front and rear gardens. Ideally located for the full range of superb amenities including local shops and supermarkets, retail park and gym. excellent public transport links with bus routes and Supertam network with access to the city, principal hospitals and universities, road network to city and motorways, walks in nearby countryside and further amenities in Hillsborough including shopping centre, pubs and restaurants. The accommodation comprises an entrance hallway with wooden flooring and stairs with glass balustrade to first floor landing. The lounge has bay to the front and wooden flooring extending into the dining area with rear window overlooking the garden and open plan aspect into the kitchen. Fitted with an range of base and wall units in white with contrasting granite effect work surfacing, integrated oven, hob and extractor, plumbing for washing machine tiled splash backs, side window and rear access door. On the first floor, the Master bedroom has bay to the front and carpeting. Double bedroom two has carpet ad rear window, bedroom three provides flexible accommodation as guest bedroom, nursery or study,. The Bathroom has modern three piece suite in white comprising WC, wash basin and "P" bath with shower over, screen and tiling. An early viewing is absolutely essential.